Dodd, Jordan, Liahona Research, comp. Illinois Marriages, 1790-1860 [database on-line]. Provo, UT, USA: Ancestry.com Operations Inc, 2004. E-mail written Oct 201 to Lew Griffin from Peggy Kimbrell, e-mail address. Obituary of Viola E. Culpepper (#48131), published 6 Feb 2013. Obituary* 16 Aug 2015� Lucy E. Culpepper, age 94 of Lynch, KY, passed from this life on Thursday, August 13, 2015 at the Tri Cities Nursing and Rehabilitation Center. She was born in Hyden, KY on July 13, 1921 to the late Abijah and Mollie Morgan. Lucy was a homemaker who believed in the Methodist faith and a member of the Rebecca Lodge. 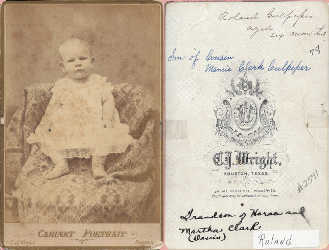 Besides her parents, she is preceded in death by her husband, Charles H. Culpepper, who was a coalminer; children, Charles H. Culpepper, Jr. and Louise Culpepper, who were infants; and 8 siblings. Obituary* say 22 Aug 2015� Charles Robert Culpepper, 58 of Portland OR, passed away on Wednesday, August 19, 2015. He was born on September 1, 1956 in Ruidoso, New Mexico to Charles Z. and Helga Culpepper. He became an Eagle Scout in 1972 and graduated from Canoga Park High School in 1974. He served in the US Navy from October 29, 1974 to February 26, 1976. Chuck was a registered nurse from 1983 to 2005 and worked for Doctors without Borders from 2005 to 2014. He married Josephine Mukeshimana on August 6, 2005 in Kigali, Rwanda. Chuck was a member of City Bible Church and was known for being charitable. He enjoyed the outdoors and was an avid camper and fisherman and loved his children. Chuck is survived by his wife Josephine Culpepper of Portland OR; daughters Faith and Hope Culpepper and son David Culpepper all of Portland OR; mother Helga Culpepper of Las Vegas NV; sister Linda Harand of Las Vegas NV and several nieces and nephews. He was preceded in death by his father Charles Culpepper on February 11, 2014. Obituary of Christine A. Culpepper, published in Tullahoma News on Sept. 26, 2015.